Onlime is a specialist provider of Digital Communications, whether over fibre, wireless or satellite. The Onlime sales and projects team will evaluate your requirements and suggest cost effective solutions to meet your objectives, using one or more of the many technical solutions available from within our own team or our partner service providers. The Onlime POP in London Telehouse East has dedicated fibre connections to Tier 1 Internet providers and to the ACE submarine cable, and is the hub of the Onlime digital communications network, directly connecting our TechnoPark in Germany with customers in West Africa and beyond. Access to such extensive fibre networks enables the delivery of high quality MPLS services and managed DSL/Internet networks globally. Onlime’s fully managed IP MPLS private network offers the possibility of connecting all of your sites to a single IP network, allowing data, voice and video convergence. Our MPLS service is ideal if you wish to interconnect all of your sites on a homogeneous IP private network with flexible bandwidth and routed voice and data on a single IP private network. If your company has several operating sites in the same city, the same country or even spread across the globe, we can assist you to communicate through a network using the robust and proven technology of MPLS. We manage the supply, configuration, rollout and maintenance of the termination equipment (CPE) installed at your offices and we will ensure there is a simple transition from your existing supplier. The CPE forms part of our network so delivery of the service to that point is covered by our SLAs. Our MPLS network is fully redundant and connected by diverse fibre optic paths creating a robust, redundant, high-availability network. Where data, voice and video are converging on IP, it is important that each type of traffic is prioritised accordingly. Onlime’s managed MPLS network is subject to your full QoS requirements. Onlime’s Managed Internet will provide your enterprise with a world-class, dedicated solution that gives you a clear, secure, high-speed connection to customers, suppliers or employees via voice, video or data – anywhere, anytime. Using your existing connection, we monitor your access around the clock and proactively manage and maintain it, right up to the CPE in your offices. As a result, we resolve most problems before you are even aware of them. Reliability is guaranteed with our cost effective solution and standard service level agreement with a credit-back guarantee. Onlime has a full range of video conferencing and telepresence solutions including software clients or full board room systems backed by our 24×7 NOC. Customers with multiple global sites can reduce travel costs and improve business effectiveness and productivity by utilising Onlime’s video conferencing solutions which provide high quality, reliable video connectivity between locations. Our access to an extensive fibre network puts Onlime at the heart of a Content Delivery Network. Onlime can deliver media files, software, documents, live or on-demand streaming media and endless applications to a host of servers around the world. Onlime is a shareholder in the ACE submarine cable (Africa Coast to Europe) and provides Internet, data and voice services from its POPs in Europe to West Africa. Onlime is a shareholder in the ACE submarine cable (Africa Coast to Europe) and provides Internet, data and voice services from its POPs in Europe to West Africa. The principal points of entry in West Africa are Freetown in Sierra Leone and Lagos in Nigeria, where ACE hooks into the Onlime data network. 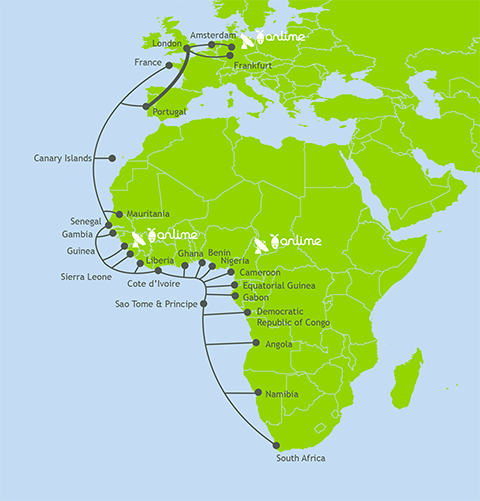 Onlime delivers MPLS services in Sierra Leone from its POP in London Telehouse East, where it interconnects with international carriers. Our Enterprise Class solutions include high capacity point-to-point links for delivery of Internet to mobile operators, ISPs, as well as to enterprises with high data requirements and are both flexible and scalable to cope with growth within your organisation. We guarantee you a quality connection and 24/7 support from our multilingual Network Operations Centre (NOC).